Happy Thursday, all! Today is our July installment in the Church Triumphant series. This month I am spotlighting St. Anne, whose feast is this Saturday, July 26th. Let us embark! I'll start with a few facts about St. Anne's life, and move into some personal stories about my relationship with St. Anne, since she actually features quite prominently. :) We don't know a lot about her life, but St. Anne is the mother of Our Lady, grandmother to Jesus. Traditionally. St. Anne was thought to be much older than usual childbearing age when she conceived and delivered Mary. So, God used this as an opportunity to show His providence and how special Mary would be in his larger plan. Since St. Anne was older from the time Mary was a child, Mary wouldn't have had the benefit of her mother's guidance as long as other girls her own age. And Mary certainly would have needed her mother's support for the major events about to transpire in her life! Good thing she had St. Anne to intercede for her in heaven. :) Devotion to St. Anne was well established in the East in the early Church, and gained popularity in the West in the 16th century. Ok, so how do *I* know St. Anne? Well, settle in, dear reader. :) It all goes back to, let's see...2002. Around that time, I was going through a lot of upheaval in my life. I had made the decision to leave my legal career and go to library school full time, but I hadn't told everyone yet. My admission was lined up, but I hadn't given my notice at work yet. This decision obviously had far-reaching financial and emotional consequences attached to it. Additionally, earlier that year, a promising relationship that I had been in with a Catholic man ended. And at this point, I'm in my late 20's, that age when people are really wondering if you're going to meet someone and get married. Combine this with already being a shy person, and you know...it gets you down. :) As well, our beloved family dog died after a long and painful battle with epilepsy. Things were challenging, to be sure. In December of 2002, I drove up to Montreal and Quebec City with some girl friends for a Catholic getaway. I think of this trip as a quarter-life crisis for Catholic nerds. We journeyed to shrines. We went to daily Mass even though none of us spoke French. We found Catholic gift stores and monastaries to stalk. We had a fabulous time. One of the places that we visited was the shrine of St. Anne, north of Quebec City. It was Advent, and everything looked lovely, with the nativity scene just awaiting the Babe come Christmas Eve. I remember praying over by that nativity, and the church was very quiet. Apparently, journeying northward in the month of December isn't high on the vacation priority list of most people. :0 I prayed, asking for the intercession of St. Anne, for my vocational discernment. If God wished for me to marry, I needed to know WHO he wanted me to marry. And so I asked St. Anne to pray for me to find the man I should marry. For the first time in my young adult life, I felt peaceful about my vocation. Maybe I would meet someone, and maybe I wouldn't. But either way, it was ok. I had prayed about it. I could have confidence that I was doing God's will. Less than a month later, I get a phone call from Mike, Future Husband of the Catholic Librarian. :) We had gone out on a date the previous November, and while it went really terrific, we hadn't ended going out a second time. My affection regarding our date remained though, and apparently it had for him as well. He wanted to know if I would have dinner with him again. I said yes, and the rest is history. :) I came to find out much later that at that time, Mike's mom was attending a parish named after St. Anne. While she was a parishoner there, she regularly prayed for Mike to meet someone and get happily married. Fast forward to the summer of 2010. Mike and I have been married for 5 years, and we have 4 year old Henry with us now as well. We are hoping that another child will enter our family as well. That summer, Mike and I watch the Showtime series "The Tudors" in the evenings after Henry is sleeping. I am in no way recommending this show :0 (the violence alone is stomach churning, and the episode wherein St. Thomas More and St. John Fisher were executed reduced me to a puddle of tears), but it got me to thinking about the name Anne. "I really love that name," I said to Mike. "So do I!" he replied. Soon thereafter, we were expecting a baby. :0 Anne struck us both as a favorite, and we never wavered throughout my pregnancy. Although we got the inspiration from Anne Boleyn, Anne is also my mom's middle name, and *she* is named after St. Anne. So there we go, perfect. Thus, St. Anne has had quite a large influence on my life and family. I am praying the novena to her currently, as I do each year. St. Anne, please pray for us! 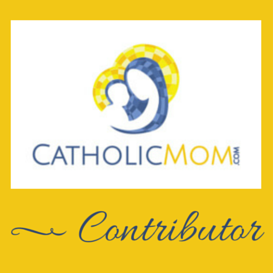 Do you have a devotion to St. Anne? Leave me a comment! I'm named after St. Anne too!! It's my middle name (Elizabeth Anne..and I go by Beth Anne). The funniest part is that people ALWAYS spell my name wrong and for years I would get mad (okay I still do) and people never understood but I would be all but "Ann" isn't the right saint! HA! My mom had trouble conceiving and had 2 miscarriages before I was born. She used to pray in a church called St. Elizabeth Ann Seton and my dad liked St. Anne (that is all my mom has told me) but I'm sure it has to do with them being older parents and all. Yes...people always wanted to call me Bethany or MaryBeth...I have NO IDEA why...oh the joys of names. Now I'm curious my mom told me about a place in Canada that has a devotion where you pray kneeling up a flight of stairs (because my dad did it years ago)..did you go there? I'm betting that St. Joseph's Oratory. And we also went there. :0 Because we're Catholic. Nerds. I had to RT this one. 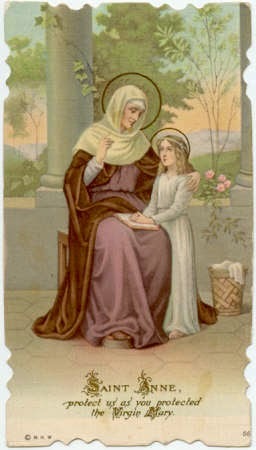 I've always prayed to St Anne on family problems, and since I'm a grandfather I now pray to both. I love your stories! I prayed the novena to St. Anne for the first time this year; here's hoping I'll have a story to tell someday.